I can still hear Republicans during the election admitting that Trump wasn't the the best guy for the job, but it didn't matter because he would assemble an A-Team that would have made Col. John "Hannibal" Smith (played by George Peppard) proud. Remember Hannibal? It's been 34 years since the original "A-Team" debuted on NBC. 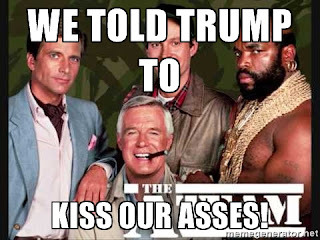 The much hoped for A-Team that Trump gathered around himself turned out to be a B-Team. Actually, more like a Z-Team. It couldn't have turned out worse. Republicans hoped Chump would gather the best-of-the-best political conservative operatives and staff his cabinet with them. They reasoned that with all that experience Lump would be propped even though they knew he was an orange clown prone to lying daily on twitter. It never occurred to these same Republicans that Frump didn't know any politically experienced people. He bribed plenty of politicians, but that doesn't count. Lump did what came natural to him; he appointed his billionaire pals to positions of power. He also threw in some white Supremacists for good measure. We all know that now. In the course of 30 days, Bump has thrown the country into chaos. Whispers of impeachment are drifting through the halls of power where information leaks are driving Chump crazy right now. It's only a matter of time before the orange vulgarian cracks. He's never been called out for lying so much in his life! He can't fire two-thirds of the American population. Frump's current attacks on the free press - calling it the enemy of the people - is even shocking those Republicans who backed him. They're seeing what the rest of the country already knew - Trump is the biggest challenge to democracy and liberty in our history.